Egypt’s National Security sector has been engaged in a fierce war against terrorism over the past five years since June 30. 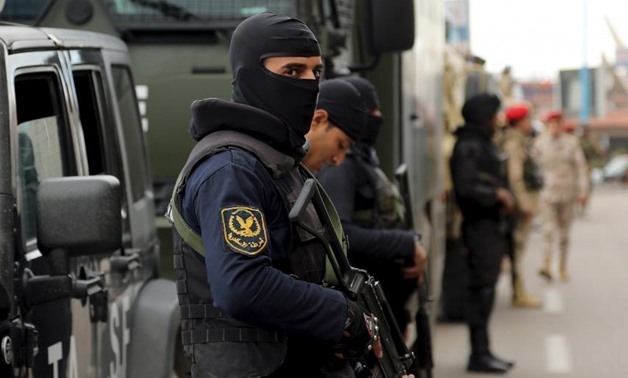 Egyptian security forces showed a lot of strength and efficiency in the fight against terrorism, despite the big numbers of victims of the many assassination attempts that plagued the country in the last few years. Former Interior Minister Mohamed Ibrahim faces a failed assassination attempt in Cairo when an IED blows up his motorcade, injuring 22. Security director of Alexandria survives an assassination attempt after a massive explosion targeted his convoy at Rushdy district in the center of Alexandria governorate, which resulted in the death of police sergeant Ali Galal and the injury of three other policemen. Egyptian National Security Officer Mohamed Mabrouk, 34 years old, was assassinated by masked gunmen who opened fire on the officer’s car and shot him dead. Mabrouk was assassinated while he was leaving his residence and heading to work. The Interior Ministry released a statement in which it announced that 16 security officers were killed during clashes with militants in Wahat in the Western Desert, which led to the killing of 15 militants. Ajnad Misr, a militant, detonated a bomb near the Foreign Ministry in downtown Cairo, killing two lieutenant colonels and a key witness in a trial against former President Mohammed Morsi. Egypt has been increased its activity addressing cross-border terrorism concerns, particularly about the smuggling tunnels between Sinai and Gaza. The tunnels allow explosives and other such materials to enter Sinai. Egypt managed in the last year to locate and destroy most of these tunnels. The amount of checkpoints in highly-impacted areas has also been increased and security vehicles have been reinforced in an attempt to implement measures to combat IED use. There are a number of terrorist organizations known to be operating in Egypt, and terrorist attacks can occur anywhere in the country. Terror groups such as Ajnad Misr and Ansar Bayt al-Maqdis (ABM) in the North Sinai became a consistent threat to Egypt especially after the ABM pledged allegiance to the so-called Islamic States (IS) group in November 2014. With the ABM receiving training and funds to conduct major terrorist attacks on Egypt National Security personnel, public venues (tourist sites), civil aviation/modes of public transportation, and a diplomatic facility, both civilians and security forces are now regular targets. The terrorist attacks in Egypt are at its zenith, National Security officers are regularly challenged to find an improvise way and distinct approaches to eliminate the terrorist threat. More than often, the current investigative tools at national security’s disposal, such as the DNA or polygraph test, are not sufficient enough and can’t keep up with the news ways terrorist perpetrate their plans. Authorities must find new and more appropriate technology to strengthen their counterterrorism strategy. How can agents gain specific information related to this case with minimal efforts and human intervention? How can they discourage and arrest masterminds of these extremist group? How can they protect citizens and national security from being the target? iCognative by Brainwave Science provides an ultra-modern technology to distinguish between terrorists and innocents by identifying the information stored in a terrorist’s memory bank. This revolutionary and reliable technology can provide authorities with better intelligence used to determine when a future attack could be carried and link to the extremist group. iCognative can access suspect’s brain to provide all necessary information regarding the attack or terrorist group. This supreme investigative tool is useful in more than one discipline, such as Law Enforcement, Border Security, Counterterrorism, Counterintelligence and in entire Homeland Security, providing invaluable results for investigative officers across the globe. In our case, iCognative can be of vital aid in gaining valuable intelligence. In order to conduct a test, a test case needs to be built for this situation. A series of confidential information (stimuli) will be input into the iCognative system, only known to the perpetrator and investigator. This stimulus then displayed on a monitor screen to suspects. These stimuli can be in the form of words, pictures or phrases, depending on its availability. These stimuli could be materials regarding bomb-making, the link with ISIS, link with previous attacks, people involved, the location of attacks – all these can play the role of stimuli in the iCognative test. This test can be used on any suspect relevant to this crime or terrorist organization or attack. iCognative system collects brain responses to each stimulus while conducting test and all these brain responses are analyzed at end of the test by unique software and determine with 99.9% accuracy if the information is present or absent in the brain of the suspect. iCognative relies on detecting a distinct change in electrical potential current, “Electric Response Potential” when a human brain responds to the sight of familiar stimuli. iCognative can aid authorities in making huge advancement against terrorist and militants. iCognative by Brainwave Science has a proven track record of supporting national security agencies protect innocents and help Anti-Terrorism Police capture all terrorists within the country.